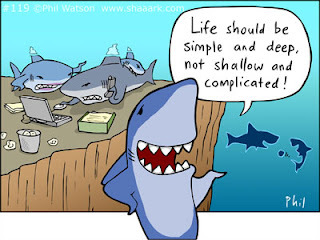 As the Cartoonist Phil from Shaaark puts it, "Life should be simple and deep, not shallow and complicated"
Learning to dive can make that happen for just about anyone. Learning SCUBA can give you the freedom to travel, meet new people, and escape from a hectic life. 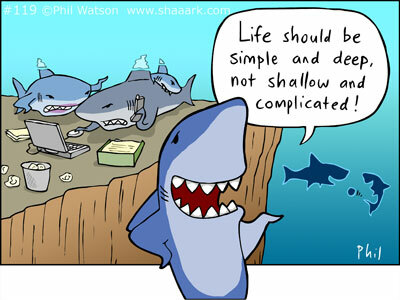 Fortunately GPS, email, cell phones, and laptops cannot work when you’re underwater. It’s only you, your dive buddy, nature, and the tranquil sound of your bubbles. Unless you have a full face mask with communications, you can’t even talk underwater. How calming is that? For me, it’s a form of nirvana. It's therapeutic. It's relaxing. It's surreal. It's diving. Something I can only do because of proper training; training that I could only get from a reputable dive shop with reputable instructors. At one point waaaay back when, if you were interested in learning to dive you had to be able to run a mile uphill in the snow in full scuba gear tank included, do 1000 push up while wearing a set of twin tanks in less than a minute, then drink 3 pitchers of beer and go win a fight. Well not really, but it sure did sound like that after all the stories I’ve heard about “back in the day”. When diving first started, we have to admit, it was an exclusive "Men's Club". But with new technologies, evolving social acceptance, better equipment, and more knowledge about it; diving has become obtainable by just about everyone. More importantly, it is safe for just about everyone. Learning to dive also gives you the ability and the excuse, to go somewhere new. Like a scuba vacation to Belize, Cozumel, Cayman Brac, the Red Sea, Florida Keys, Alaska, Great Lakes, Hawaii, Bahamas; just about anywhere there is a shore, you will find divers. And with proper training, you can be one of those divers. Just for clarification, a shore can be almost anywhere, not just the white sandy beaches someplace far away. It could be the 288 lake, Huntsville, Lake Travis, Corpus Christi; just about anywhere, near or far. That nirvana I spoke about earlier, I personally can obtain that feeling in a pool, or 288 lake. After a long rough day at work or home, a dive can do the trick to get a smile back on my face. All I have to do is grab my dive gear, a scuba tank, and off I go to the bottom. I don't even have to swim around down there. I can just sit and watch my bubbles for hours (or as long as my scuba tank will safely last), and I can escape. To me, Scuba diving is a reality that helps me dream. 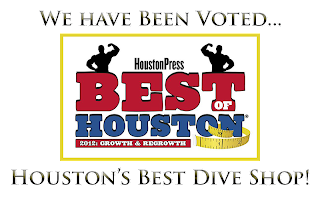 If you or someone you know is interested in learning to dive, send them our way. 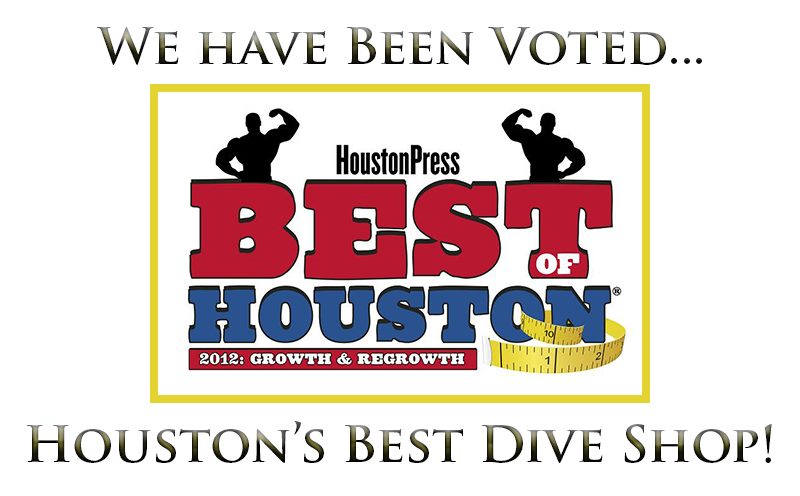 We would love the opportunity to share our love for diving with someone new! Which Dive Computer or Algorithm is for you? This is a re-post from an unknown source. "An algorithm is the mathematical formula a dive computer uses that factors in real-time measurements of depth, gas mix, time at depth - and, depending on the algorithm, potentially lots of other data to calculate how long you can stay underwater with a reasonable degree of assurance that you won’t get hit with decompression sickness (DCS). There are currently about a half-dozen different algorithms being used in dive computers, each using its own proprietary computations, and each with its own "liberal" or "conservative" leanings. Computers that use more conservative algorithms lessen the risk or likelihood of DCS by limiting dive time. Computers that use more liberal algorithms provide the opportunity for longer dive times, but, of course, more time spent at depth also increases the risk of DCS. So which is the best? It really comes down to the individual diver's comfort level. However, divers who have preconditions that might make DCS more likely (age, poor circulation, poor physical conditioning) should always go the conservative route. Most new computers offer methods for programming personal safety adjustments that let you increase the conservatism of virtually any dive computer." The following has been added by us. Dive computer algorithms function by calculating the “on gassing” and “off gassing” of nitrogen in the body's tissue compartments. Each tissue layer in the body has different rates which this gas exchange occurs; organ tissue and light muscle tissue have much faster exchange rates than fat tissue and dense muscle groupings. Because there are so many different tissues it is impossible to calculate the exact rate for each person's individual tissue layers. Because of this we operate with ranges. The U.S. Navy Tables use 6 compartments labeled as 5, 10, 20, 40, 80, and 120. These numbers correspond to the amount of time this tissue takes to reduce the amount of nitrogen by half. To be conservative, basic computers use only 3-4 body compartments or tissue rates, Slow-Mid/Slow-Mid/Fast-Fast. With these four groupings a computer can calculate how much nitrogen your body has absorbed and plan decompression accordingly. As computers have progressed through the years and evolved, the algorithms used have also grown and changed. Newer computers are able to calculate around 10 individual tissue rates. This allows the computer to more accurately calculate you nitrogen levels. For example an exchange rate that might have been lumped in with Mid/Slow but is now much more refined into Mid/Mid/Mid/Slow. Because of this accuracy you have greater bottom time without the risk of DCS. The added bonus to this is that your surface interval and post dive times for off gassing will also be more accurate. To try and stay competitive, dive computer manufacturers use different algorithms based on different compartments, hence have different no-decompression limits. Not saying one is better than the other, but some divers prefer some brands over other brands. For more information on this, feel free to call us at 281-445-3483 to discuss the options for you. Labels: dcs, dive computer, diving, how to choose a dive computer, how to pick a dive computer, no decompression limits, scuba, which dive computer is for me?